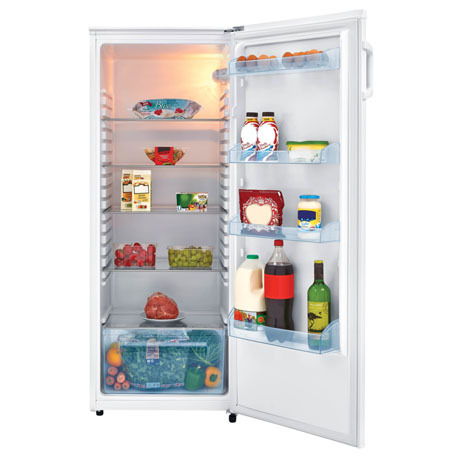 This Fridgemaster Tall Larder Fridge makes it easy to stay stocked up on all your favourite treats. Boasting a large 250 litre storage capacity, it can hold up to 13 bags of food shopping – perfect for your big weekly shop. 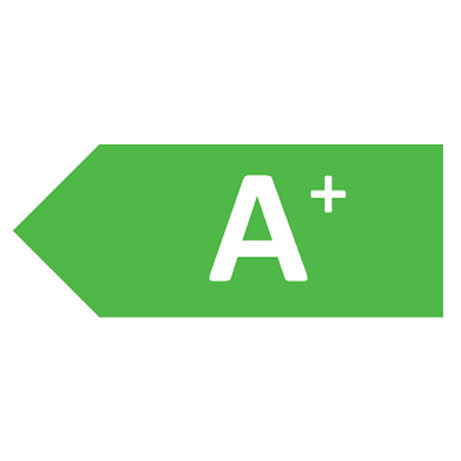 As it has an efficient A+ energy rating, it will be kinder to the environment as well as your utility bills. The handy salad crisper drawer is ideal for fresh fruit and vegetables, so you can keep your groceries neat and organised and fresh for longer. It even has a reversible door (Reversed as part of the delivery service free of charge) , which means it will fit seamlessly into the design of your kitchen. 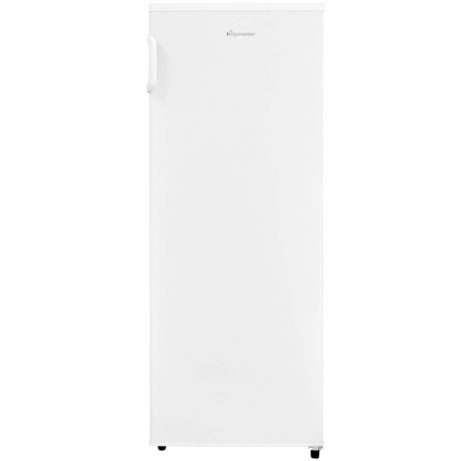 This 250 litre Fridgemaster Tall Larder Fridge comes in white, so it should integrate nicely into your kitchen, without clashing with the other units. Inside you’ll find 5 glass shelves, which are adjustable so as to provide ample room for all your fresh groceries, as well as a vegetable crisper, for keeping all your fruits and salads fresh. You’ll find additional space in the door where there are also 4 shelves, spaced adequately apart for varied bottle sizes. Also included, on one of these shelves, is an egg tray, securing individual eggs in place, so they don’t roll out when you open the door. 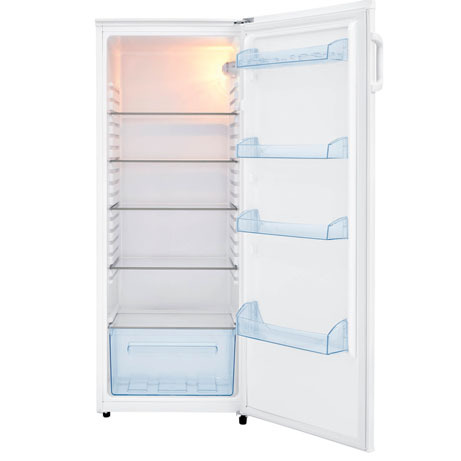 You should find this Fridgemaster Larder Fridge suitably accessible thanks to its interior light which fully illuminates all of your produce. Furthermore, you’ll not lose any sleep or money with this appliance, as it only generates 43dB of noise and boasts an energy efficiency class A+. 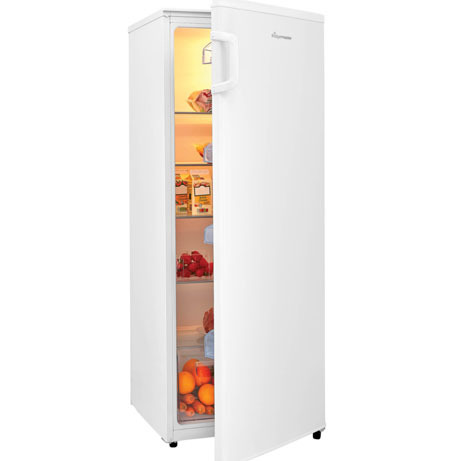 The Fridgemaster Tall Larder Fridge is a spacious, energy efficient kitchen appliance. 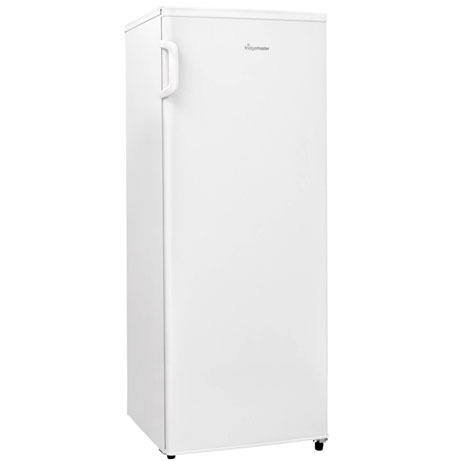 This Fridgemaster Tall Larder Fridge even has a reversible door, for greater accessibility, should you wish to open it to the left rather than the right.